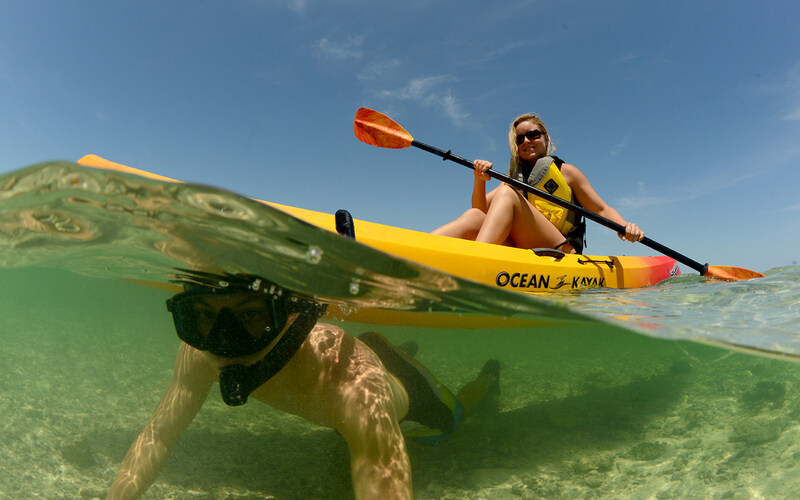 Kayaking in the Marathon, Florida Keys’ area is one of the most peaceful and meditative activities on the water. Paddle with confidence, knowing our rental kayaks are in excellent condition. Their sleek design makes them ideal for cruising the Marathon shoreline. Our single kayaks are perfect for those who want to paddle independently. Our tandem (double) kayaks are stable and maneuverable. They’re fun for couples or parents who want to bring a child. Whether you are a beginner or experienced kayaker, you’ll have a fantastic time on the water. Your excursion can be relaxing or adventurous – it’s up to you. Marathon’s location on Florida Bay is ideal for kayaking because of its typically calm waters. The area is generally more protected from waves than the Oceanside. The Bay’s shallow depth plus the island barrier tend to create better kayaking conditions. The obvious advantage is that you can kayak to and from shore with ease, which makes for a more enjoyable adventure. Also, the clear and shallow water is perfect for viewing marine wildlife! If you choose a one-hour kayak rental, we recommend checking out the historic Faro Blanco lighthouse and the beautiful Marathon shoreline from the water. With a half day kayak rental, you’ll have plenty of time to explore our pristine environment. Start by paddling east along the shoreline, then loop back and pass Palm Island. It’s a luxurious private island, adorned with stretches of white sand and tall palm trees. While kayaking, you are likely to encounter all kinds of Florida Keys wildlife. Keep your eyes open for dolphins, manatees, and sea turtles in their natural habitat! You might even sneak up on a harmless nurse shark or spotted eagle ray. Paddle up close to the mangrove trees. The roots provide a rich environment for many tropical species. Discover mangrove snapper, colorful parrotfish and angelfish, and the occasional grouper and snook. Wherever you see coral rocks, you may spot vibrant red starfish, crabs, and even the Keys-famous, protected conch. While paddling, don’t forget to look for our tropical birds like the great blue heron, white egrets, and quirky pelicans. We invite you to book one of our rental kayaks today and enjoy a paddling adventure along our beautiful Marathon shoreline!